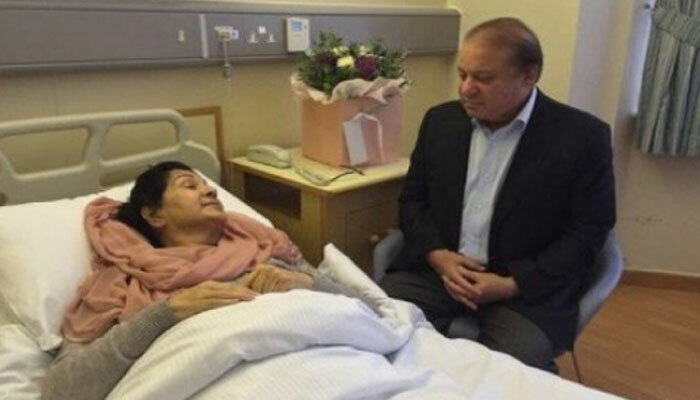 LONDON: The condition of Begum Kulsoom Nawaz, wife of former prime minister Nawaz Sharif, deteriorated last night and was shifted to intensive care unit (ICU) of a London hospital, Geo News reported. According to Geo News, Kulsoom Nawaz has been kept on ventilator, life-support machine, for several hours as she had suffered heart attack early on Thursday. According to report she fell down in the ICU after suffering cardiac arrest. Meanwhile, Maryam Nawaz, who is in London to look after her ailing mother, tweeted on late Thursday, confirming that Begum Kulsoom Nawaz had sudden cardiac arrest on the morning when they [Maryam and Nawaz] were on flight to UK. She also requested nation to pray for her mother's health. Former prime minister Nawaz Sharif and his daughter, Maryam Nawaz, arrived in London early on Thursday as they were allowed by the court to visit ailing Kulsoom Nawaz in last hearing. The wife of former premier was re-admitted to the hospital on Wednesday as per Doctors' advice.